. : Lunar Palace v.5 - USA: Sailor Venus :. Venus probably started before the other Sailor Scouts because not only did she have her own video game, but also a movie. 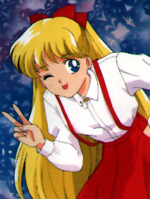 Before Serena became Sailor Moon, she dreamed she could be like Sailor V.